The site of the Colosseum is in fact a depression among the hills of Rome: the Palatine on its south-western side, the Velia on the western side, the last slopes of the Esquiline hill, also called Colle Oppio (now a park) on the northern side and the Celio on the Eastern side. The Velia, however, has disappeared: during the thirties, the hill  which was in fact a ridge between the Colle Oppio and the Palatine  was razed to the ground in order to build the modern Via dei Fori Imperiali, the road that connects Piazza Venezia to the Colosseum cutting through the forums of old Rome. Mussolini demanded a straight road from Piazza Venezia to the Colosseum, and that was the end of the Velia. The valley collected the waters, which created a marsh or a lake, depending on the season. The small lake was fed by the waters of the Rio Labicano, a stream flowing down the Labicana valley, more or less along modern day Via Labicana. The stream can still be seen underground when visiting the Basilica of St. Clemente in Via di San Giovanni. There you can descend about 30 feet under modern ground level and walk on the cobblestones of old Roman alleys, enter shops and houses, visit a Mithraic temple and listen to the soothing sound of running water. The stream is still there and the water runs clear and fast, enclosed inside a conduct built in the 19th century in order to drain the underground of the church. During the times of the Roman Republic the site was reclaimed, a drain was built to carry the waters towards the Circus Maximus and the area was densely populated with houses and temples. 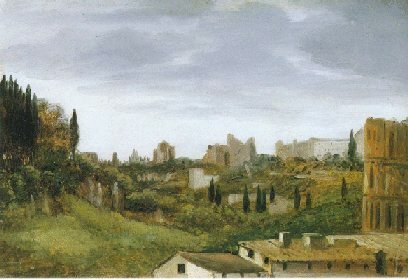 After two-thirds of the city were destroyed by the great fire in 64 AD, emperor Nero (right) used this land as a site for his new palace, the Domus Aurea (Golden House), which occupied an enormous area in the centre of the city. Many people, rich and poor alike, were dispossessed of their properties for Nero to build a house that he described as "worthy of a human being". 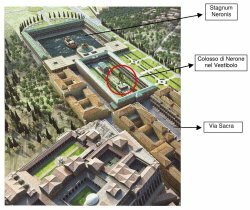 It is difficult for us mere mortals to understand the magnitude of the Domus Aurea: there were so many buildings that Nero never managed to visit all the rooms in his mansion. In the depression of the former lake Nero had an enormous rectangular pond built, surrounded by a portico with columns. 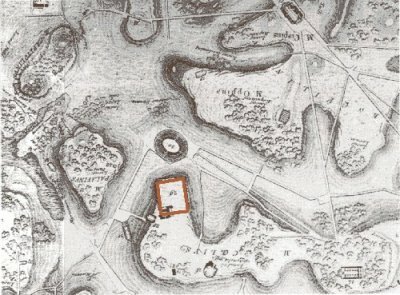 The ex lake thus became part of a huge park provided with all sorts of amenities, including the most luxurious mansions, fake fishing villages, animals, water sources and fountains. 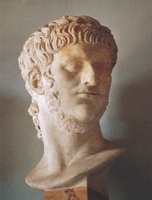 In the entrance of his palace Nero also placed a colossal bronze statue of himself (120 feet high, work of Zenodorus), whose face was later modified many times to represent different emperors. After the death of Nero in 68 AD, and after a period of turmoil, Vespasian came to power. The new emperor established a new dynasty, the Flavians, and wanted to gain popularity with the Roman citizens, showing that the times of tyranny and despotism were over: He made a point of giving back the area of Neros Domus Aurea to the Romans. The amphitheatre then  a public building donated by the emperor to the Roman citizens  stood on the former site of Neros mansion as a splendid symbol of the new political order. The official name of the amphitheatre was "Caesar's Amphitheatre", but Romans called the Colosseum "the arena", or "cavea". Dio Cassius calls it "hunting theatre", but is a translation from the Greek. Colagrossi writes that Calpurnius called it "Ovum", the egg. The name Colosseum dates back to the XI century, and it is origin is uncertain. The most popular version is that the name comes from a colossal statue of Nero, called indeed Colossus Neronis, that at first was in the Domus Aurea. 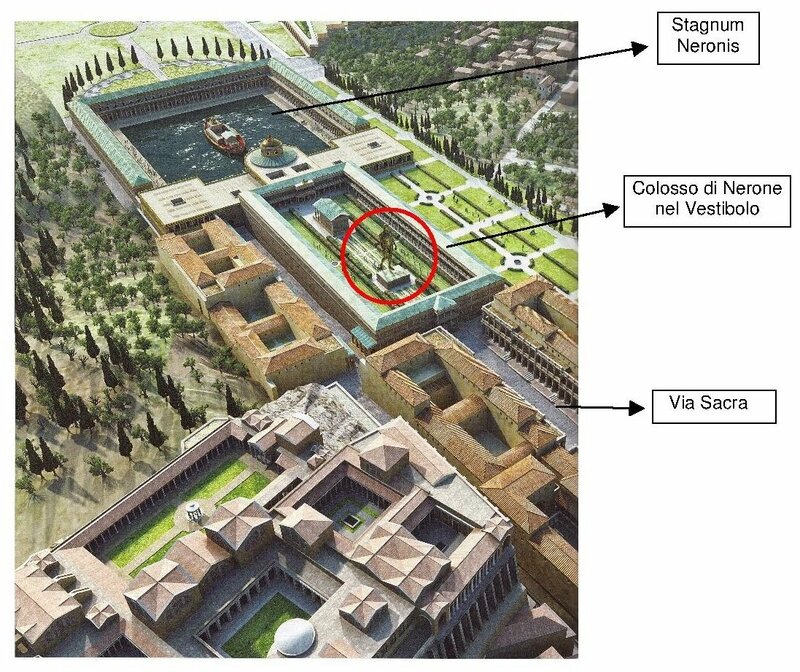 The statue was one of the most visible (and arrogant) features of Nero's residence: a 36 meter (120 ft) bronze statue of Nero placed just outside the entrance. This monstrosity was built in imitation of the Colossus of Rhodes, one of the Seven Wonders of the Ancient World. 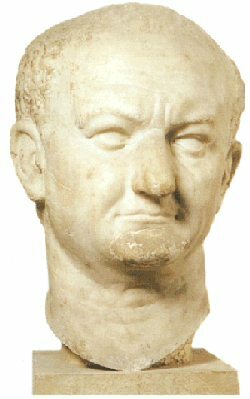 The Colossus was later dedicated by Vespasian to the Sun God - after replacing its face - and then affixed with the heads of several emperors, until Hadrian moved it near the amphitheatre. The transfer of the statue in itself seems to have been an admirable feat. Discussion among the experts is still open, though, because some have argued that 1) there is no substantial evidence of the presence of the statue near the amphitheatre; 2) the name Colosseum appears only from the XI century, when the statue had long disappeared. Another theory maintains that the name might have come from the Collis Iseum, a nearby hill where a temple dedicated to Isis once stood. And according to another curious theory, it might even be the corruption of Colis eum? ("do you worship him? "), a question that was part of a satanic rite. Legend has it that, up to the late Renaissance age, the Colosseum used to be a chosen site for performing pagan and black magic rituals at night-time.